While overall sales of hip hop has been on a sharp decline for the past few years, my interest in hip hop by LGBT artists (“HomoHop”) has been on the rise. Two reasons, can be attributed to queer artists shaping up their game to give a polished product and the larger variety of hip hop available. In fact, three of my favorite hip hop CDs of 2007 were by gay artists. On Some Other by Deep Dickollective is a collaborative effort by the historic group, offering clever wordplay and strong political content. Tim’m West followed up his popular Red Dirt Revival with the even stronger Blakkboy Blues. And Tori Fixx crafted some banging hip hop dance tracks for his project Code Red. Women haven’t been hiding in the wings, either. 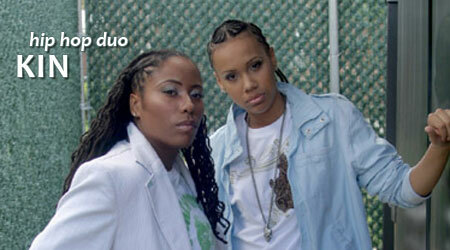 January’s edition of television documentary series In The Life profiled lesbian hip hop duo KIN, who have been laying it down for the past 10 years. KIN (Nor and IQ) also appear in black./womyn. :conversations…, a feature-length documentary focusing on the lives and views of lesbians of African descent living in the United States premiering February 3rd in Philadelphia. Recently, AllHipHop.com featured the busy group in a interview in which they discussed how it feels to be out as artists, having their own label, and how they hooked up with a club track produced by Pharell of the Neptunes. Also, they admit that earlier on they concealed their sexuality as a result of feedback from people in the industry. However, Nor says they dumped that tactic after touring and getting heavy support from the LGBT community. We woke up one day and said as a female rap group, as a Hip-Hop group, you know what the struggle is performing and getting on the road. The people in our community were supporting us. We were touring. These are people in my community that deem us famous enough to get paid. No major record label deal. And these are people from the gay community. How can I look at them and not release all that it is that I am when they are the only people that are supporting me? That really started to flip in my head about five years ago when we really started to tour heavy. The people in the LGBT community wanted to support us. I wanted to not disrespect that. You can read the full feature on KIN at AllHipHop.com and view their “I Am What I Am” segment at In The Life’s website.